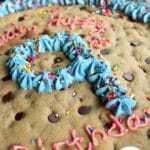 Grab the family and let everyone get involved in recreating this Homemade Chocolate Chip Cookie Cake recipe. It's well worth the labor and a dessert recipe that can used to be celebrate birthdays, holidays or just to brighten up someone's day! Set cookie dough aside in the refrigerator to let chill for at least 30 minutes. Place cookie dough on a large round stone and roll out. Be sure to leave a 1" edge all the way around so that your dough can expand as it bakes. Bake for 20-25 minutes. The trick is to not overbake. While the cookie is baking make your icing. In a large bowl, beat shortening and butter until smooth and fluffy. Add the vanilla, heavy cream and mix until smooth. Add the powdered sugar 1-2 cups at a time, mixing well before adding more. Beat the frosting for an additional 4-5 minutes until light and fluffy. If using multiple colors separate icing into mixing bowls, adding food coloring/dyes until you get the desired color. Refrigerate icing in piping bags for 20-30 minutes before you are ready to use. Ensure the cookie cake is completely cool. Grab the kids if you can and let them help!